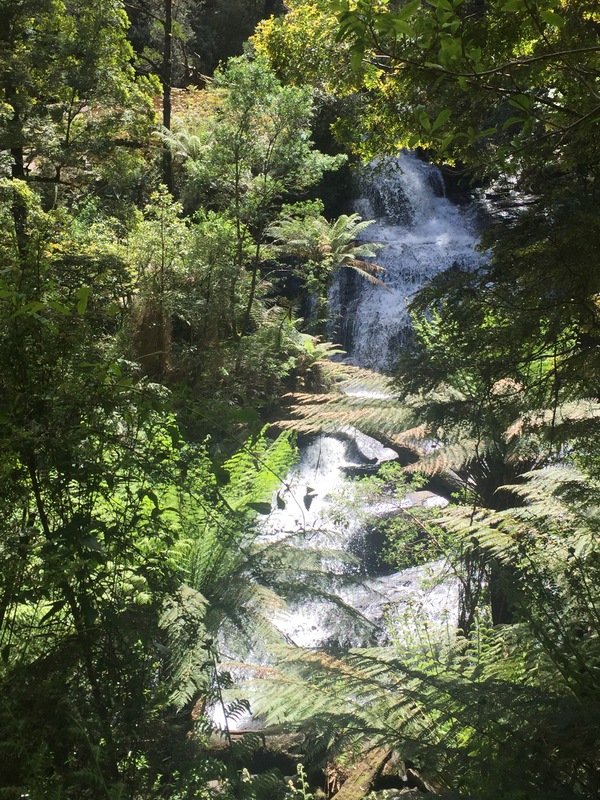 Our final full day of our Great Ocean Road trip was to explore the Otway National Park. We were still buzzing over the day before and so gave ourselves a lie in until check out and then headed out for more exploring. Our first stop was Mait’s Rest Rainforest Walk. This was opened in 1993 and is a temperate rainforest with giant ferns that go above your head and look like a tropical rainforest without the humidity and the heat. It was actually quite cold because of the tree cover and shade which I hadn’t really planned for. It was really cool to see and had some enormous trees as well. The Triplet Falls were our next rainforest walk, called that as there are three falls coming from the river down the forest cliff. The water runs over huge rocks down a rushing river to lots of smaller falls moving down the river and through the rainforest. There used to be a big timber mill in the forest and there are still machinery left in the forest which is really interesting. I read that they were there before cars and so it must have taken so many people to move the machinery there. I imagine it was brought there in pieces and put together in the forest – there weren’t wide paths so it must have been hard to navigate it down the hilly forest paths. We had to drive through very small and windy roads to get out of the National Park which was quite a challenge for Niall, especially as some cars coming the other way were going way too fast and not sticking to their side of the road. Niall handled it excellently and got us out without a scratch. 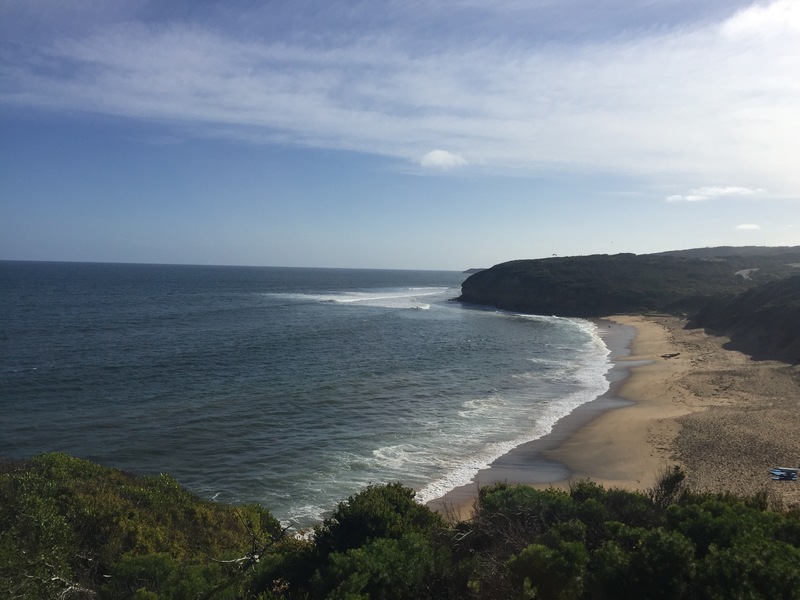 We then drove back onto the Great Ocean Road which gave us new beautiful views of the coastline as we moved higher into the mountains. We were told about a koala walk in Kennett River so headed there next (I am slightly obsessed with koalas now!). Unfortunately there weren’t that many and they were high in the trees, but after the day before with seeing so many at Cape Otway we didn’t really mind. There were tour groups which were given bird seeds and the parrots and cockatoos in the area were jumping onto people’s shoulders and heads to eat them – that stole the show a bit compared to the koalas. 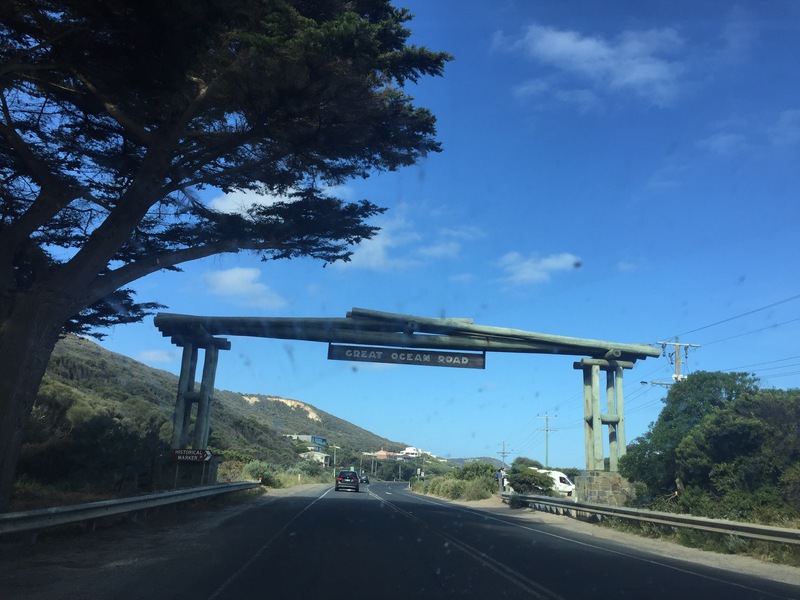 On our way to our final hostel stop in Torquay we passed through Lorne which is a popular place on the weekend for people in Melbourne to go and enjoy the beach and eateries. It was so busy with a lot of people surfing and relaxing in bars along the beach. Our final stop was to visit a famous surfing spot in between Lorne and Torquay called Bell’s Beach. Apparently, if you’re a surfer, then this is a must stop spot and we saw loads of surfers out along the coastline. We also saw paragliders which was really cool as they landed right by where we were standing – I’d love to try it! We then drove to Torquay and spent our last night here before heading to Melbourne to return our rental car and settle for the next 5 weeks. A tour group had a BBQ next door and had left overs (including veggie stuff) so we had that for tea which was great – our first Aus BBQ.